Living hinges are a cool sounding name for a simple type of hinge which has a flexible bit between two pieces and is all the same material. The example I gave was the lids of Tic Tac containers which are one unbroken piece of plastic. The subject I was reporting on was a printing technique which could print flexible and rigid lattices in combination to make strong structures with flexible portions built right in. 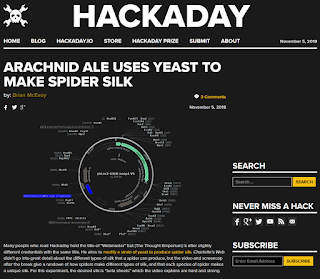 Another video by Justin Atkin was featured where he outlined his approach to making spider silk by genetically modifying yeast. There was lots of information in the video and pulling useful images for the article was easy. The feature image was specifically modified to match the exact color of the Hackaday default color. Magnet Fish Spectacular progress continued with the day the rotating platform was built. This was also the first day Angeliki's boyfriend, Ryan, helped with the project. The platform was a circle of wood made from two pieces of particle board cut as half-circles. We took turns cutting the outline with a handheld jigsaw. The platform was not perfectly round, but the circular edges were roughly the diameter of the pool it would be spinning in. The flat edges were there because that was how big the wood pieces were. We used a jigsaw again to cut circular holes in the top where our fish would go. Putting the platform in my car was not easy while it was in two halves and the wheels were expected to be unbolted each time it was transported. A couple of continuous hinges were purchased and installed between the two halves and much of the transportation stress went away. A night was devoted to planning the team's trajectory before the hackathon and to making sure the RFID readers would function as desired. One was connected to an Arduino UNO for testing and it was decided that Arduino, running on a Teensy 3.X board would be our best option. Angeliki chose Teensy because they offer a "prop shield" which has onboard memory and amplification for sound playback.